Ugh, I was in the middle of a phone call, looking out at my window to admire my hives this past week, and what do I see? 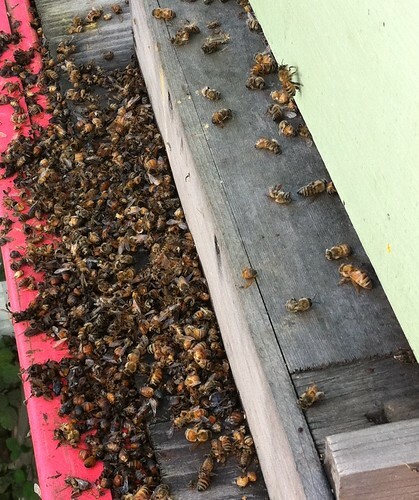 A pile of bee carcasses outside the front stoop of my middle hive. That’s a picture of it on the right. So, Internet, what’s your thought? Whodunnit? Here are my best guesses, but I’m just an amateur beekeeper, I have always depended on the kindness of strangers to guide to me. Cold: We had an early snow here in Seattle (see right), and maybe it took them unawares. The problem with this theory is that a) it didn’t effect the other two hives and b) it wasn’t that cold. Sure, it snowed, and we had ice on the roads for three or four days, but that was it. 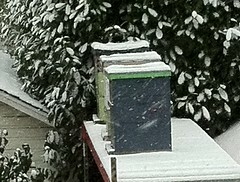 I’m sure Montana beekeepers would laugh if I tried to call this a “cold snap”. Pesticide: I visited some bee hives they have at a nearby arboretum some years ago and saw a pile of dead bees out front. When I asked, I was told that likely some bees had gotten into some pesticide somewhere and brought it home. The problem with this theory is who the hell puts out pesticide at the end of November after a snowstorm? Hornets: I’ve seen that National Geographic video of the hornets wiping out a hive of bees while the Flight of the Valkyrie plays in the background. It’s astounding. And, suspiciously, a close inspection of the bee carcasses showed most in parts, and hollow shells. However, the problem with this theory is that there are no marauding hornets in Seattle in November. Plus, I’ve been around the house recently, and I would have heard Wagner playing. I cracked all three hives to see what they looked like, and the affected hive was definitely decimated, with the remaining bees clustered in the center. The bottom brood box was mostly empty, just some bits of capped honey around the edges of the frames, a few frames of pollen and a scattering of partially hatched bees. The top brood chamber had a good strong store of honey, though, as would be expected given only November. There was a partially filled Western on top of that, also half full of honey. I removed the empty brood chamber from the bottom and left the frames out for the bees to scavenge from. That’s an odd one. The photo looks like a classic case of pesticide poisoning but even if someone were spraying this time of year, the bees wouldn’t be foraging in the snow. It wasn’t cold enough in November to kill the bees, so that’s out. The first freeze of the winter kills off the yellow jackets and hornets, so that’s probably out. No, I’m going back to pesticide. It would only take one misguided homeowner to dump a container of whatever on some unsuspecting insect (or arachnid) to set things in motion. If there was a warm day in there, a few bees could have brought it home with them and poisoned the lot. It sure looks like it. I have had hives that looked just like this. I feed my bees using a gallon can with little holes in it turned upside down at the top of the hive. Being a beginner I read most of what I knew on the internet and had read that one beekeeper liked to feed his bees warm syrup because the bees seemed to really like it. That sounded all warm and fuzzy so I did that and basically it created so much condensation inside the hive large numbers of bees were dying each time I fed them. I also think the holes I had punctured into the top if the can were too large and released too much syrup creating a sticky bottom board. They would tumble out and get stuck and die. I changed my feeding practices and I no longer had bee die off like this. I read somewhere about second hives and equipment harbouring disease? I’m just a beginner too and taking a total stab in the dark with this.